Points : 76 out of 100. Dutch guitarist Eveline van Kampen is a conservatory graduate (jazz & pop) and subesequently gathered a band around her to shape her musical ideas. The musical style of Illumion can be called symphonic, progressive rock, with references to, amongst others, Fates Warning and Marillion. The band often plays with dynamics, layers and atmosphere, and obviously tries to find their own way within the genre. Eveline showcases her able guitarplaying but also allows plenty of space for vocalist Esther Ladiges (Ayreon, Ixion, Unicorn). Van kampen is a good and an atypical singer (although she does sings a lot in the same sort of way), that gets her influencesfrom the likes of Kate Bush, Dalbello and Lorena McKennitt. Especially the many layers of the vocallines are well worked out and Van Kampens calm but aimed voice really melts beautifully with the music. 'Hunting for significance' is certainly a grower, but I must remark that with a better production/final mix (the balance between the instruments) the songs would shine more. 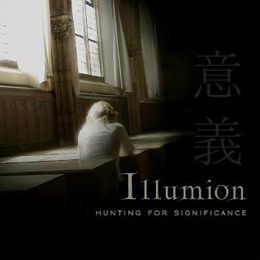 At any rate, Illumion is a band that does it their own way, and definitely has talent and growpotential.